contact between the element and the medium. Depending on design the heat transfer can be enhanced by forcing the flow of the medium over the elements. 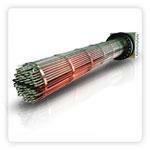 Immersion heaters are very versatile in their construction and design. Therefore their heating capacity can range from 1kW to a few MW. The range of applications is varied. View products! Browse our listing for standard immersion elements add products of interest to your "enquiry list"
or specifiy your requirements in our custom-design sections below. We offer a wide range of standard immersion heaters for applications such as heating of water and heating of light & heavy oils. 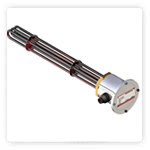 Immersion heaters are normally mounted horizontally in the medium to be heated and preferably quite low in the medium. They can be mounted vertically into the system with special design criteria. Mounting methods of the immersion heaters are also quite varied. Depending on sizing, the most common methods are either via screw-in flange or a bolt-on flange. Care must be taken that a good seal is established at the given pressure rating.